The 1,191 lbs. Revere Cooper Co. 12 pound bronze Napoleon cannon, Modal 1857, Registry # 27, inspected by Thomas J. Rodman in 1862, has been disassembled & is being stored. 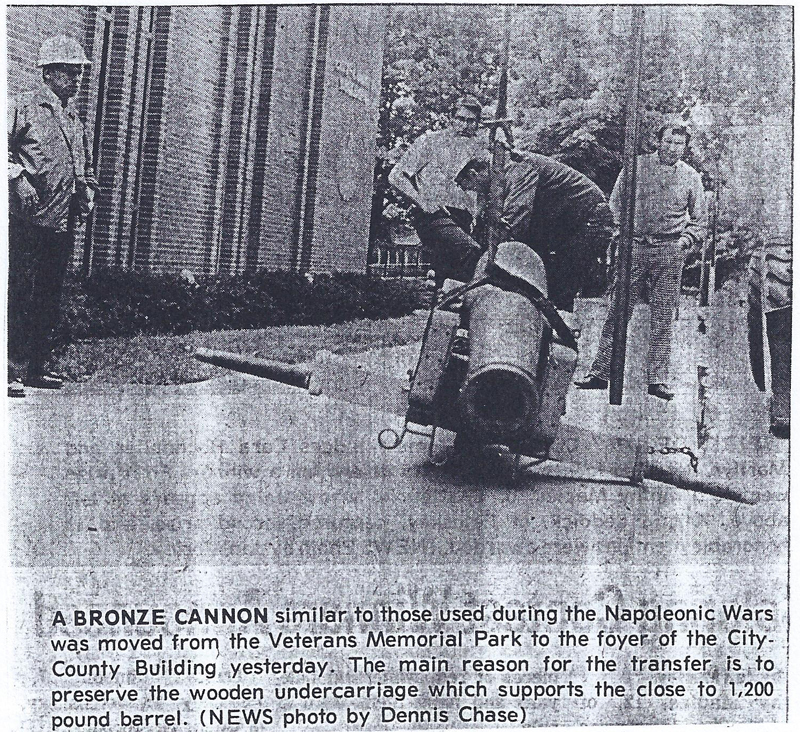 The cannon was at one time on display at the City/County Building in Petoskey but do to remodeling and some restoration needs it has been put in storage. 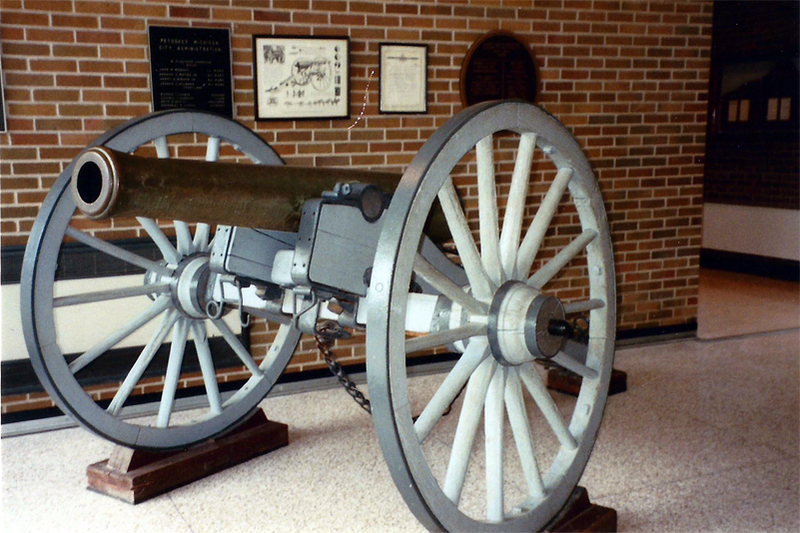 It is the intent of the County to put the cannon on indoor display at the yet to be built County Museum. The tube is in very good condition & all of the hardware is intact. Depending on the desired out come, restoration on the carriage could vary. There were some makings on the left trunnion I could not read & I was unable to turn the tube over to read the right trunnion or confirm the US stamp on the top of the cannon. I was able to feel the top of the cannon and I believe the US stamp is in place. 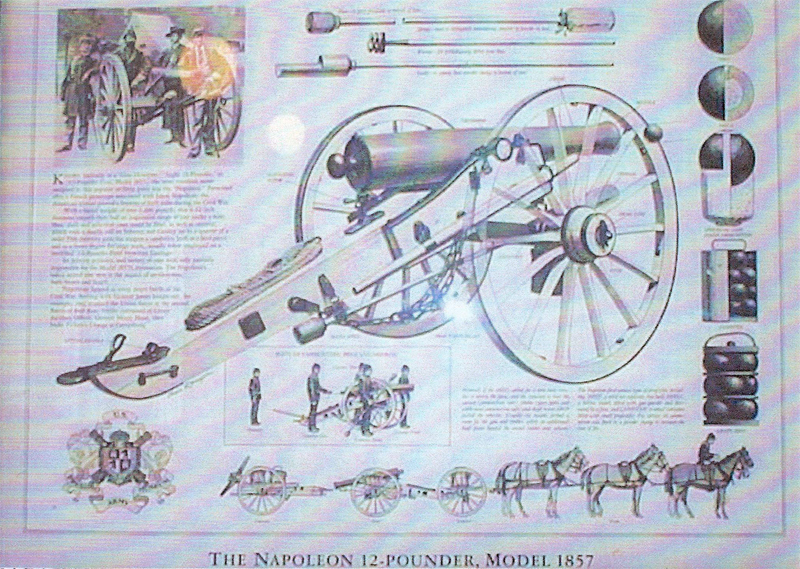 Information taken from large chart on wall, near the Napoleon 12-Pounder Cannon, in lobby of Petoskey City-County Building. Known variously as the "Gun Howitzer" "Light 12-Pounder Gun, Model 1857" the most common name assigned to this popular artillery piece was the "Napoleon" patterned after a French prototype associated with Louis Napoleon. The American version proved a favorite of both sides during the Civil War. With a barrel weight of over 1200 lbs. This 4.62 inch diameter smooth bore had an impressive range of just under a mile. Shot shell and spherical cases could be fired as well as canister, which took a deadly toll on Infantry and Cavalry up to 1/4 of a mile. This diversity gave this weapon a capability both as a field piece and to a lesser degree for siege work, usually employed on a modified "24 Pounder Field Howitzer Carriage." It's relative accuracy and variety of uses were only partially responsible for the 1857'reputation. The Napoleon's safety record also won it the support of artillery men both North and South. Napoleons figured in every battle of the Civil War. Serving with General James Longstreet for example they stunned the Union forces at the second battle of Bull Run under the command of Union Artillery officer, General Henry Hunt that broke Picket's charge at Gettysburg. This is a copy of the Research Material that Mrs. Elnora Lee used in writing her story "Our Cannon On Wheels" completed on February 14, 1977. The Northern Independent newspaper printed in Harbor Springs, at the Petoskey Museum. Petoskey Item, June 20, 1882. Petoskey has always had a hankering for Big Guns and now we are to have one all of the time. The businessmen have all joined together and ordered a 1200 pound cannon which is expected in time for the 4th. Northern Independent - July 5, 1881: President Garfield was shot twice at railroad station in Washington, D.C. on Saturday A.M. The bullets were removed on Sunday. He was enough better by Monday that he requested the 4th celebrations to go on. Chester Arthur was vice-president. Northern Independent- June 27, 1882: Petoskey plans for a grand 4th of July celebration when "the big gun will wake and call us early". Petoskey City Record — June 29, 1882 ( Thursday ): Local and Personal — The "big gun" arrived from Boston Monday, and was unloaded from the cars Tuesday morning. It weighs about 1200 pounds, and will be shot the first time tomorrow while Guiteau is dangling in eternity. Marcus Covell, brother- in- law, of Chas. Carmichael, will probably take charge of the firing. He is an old hand at the business, having served in that capacity in the regular army and long in the military service, and is also a graduate gunner. After months of researching, the 11/2 inch fine printed paragraph, in a newspaper column equal to today's tea table, tells of the arrival in Petoskey of our No. 27 Civil War Cannon. Much more space was given to the building of the Arlington Hotel, the Rosenthal block, the G.R. & I Railroad depot and the hanging of Charles J. Guiteau. The first regular train run to Mackinaw City was a week later. 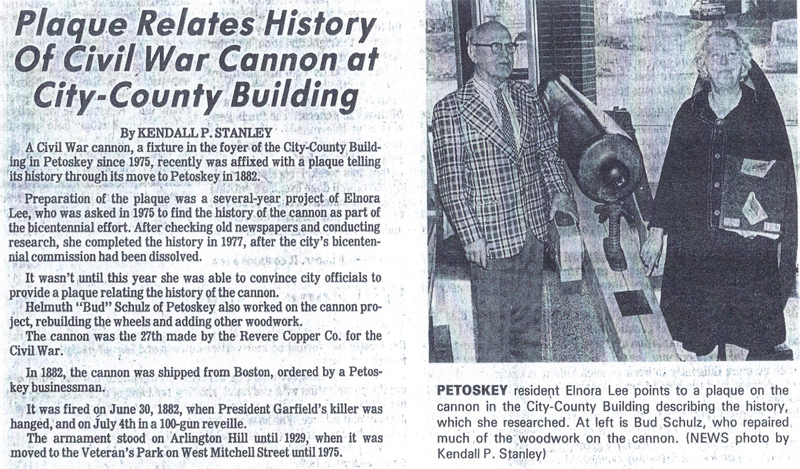 The Petoskey businessmen joined together and ordered a 1200 pound cannon from Boston. It arrived June 26, 1882 by freight train and was unloaded the next morning. It was in time for the grand 4th of July celebration, when it was to " wake and call us early" with a 100 gun reveille at sun-rise-a custom to prevail on the 4th for some years. It could speak out when the weather was too inclement for parades or speeches, as on July 4, 1884, when "the cannon boomed hour after hour from the high bluff and echoed in the fog over the bay." But the first time our "No. 27" spoke in Petoskey was to herald justice on June 30, 1882 when Charles J. Guiteau was hanged in Washington D.C. The year before he had shot President Garfield. The country was glad that justice had been meted out. Now Petoskey had a loud voice to join in that proclamation. The next year, August 11, 1883, the Lombard Post No. 170 of the Grand Army of the Republic (G.A.R.) was organized in Petoskey with 58 members. Several state officials were in town for the event. The "big gun" spoke again when J.W. Chilson fired the salute at 1 p.m. Mr. J. S. Coffman was one of the gun's owners. We can well believe that it has been fired on many occasions, but it could not have been popular with the newspaper of the era, as there is so little mention of it through the years. Tradition reveals that paths lead one up the valley to old City Park, which became the city Zoo and later, Winter Sports Park. The north hill, about a block west of the north end of Bay View-Ave. was known as Flag Pole Hill in the Park. Here was a flagpole and "No. 27" looking over the top of the hill out onto the bay, as if guarding the city of attack by sea. John Deschermeier visited the zoo and cannon many times as a lad, and recalls that the cannon was still there in 1928. After that, it was stored with its other tube until the Veterans Park was created in 1942. There, in wartime and until 1976, it reminded motorists, that America had given her men to defend our precious country. The local Bicentennial Commission desired in 1975 that the deterioration oak wheels should be preserved. The wheels were removed and worked on for some months by Helmuth Schulz. 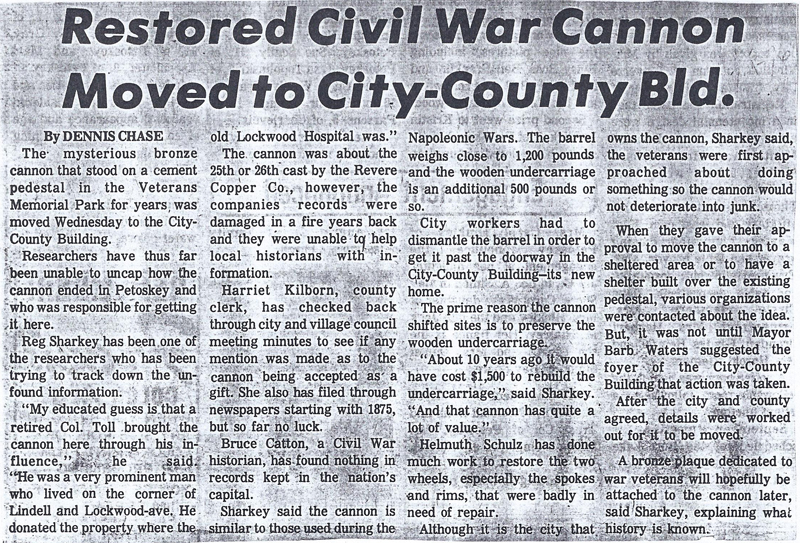 Just before July 4, 1976 the cannon and wheels were mounted in the foyer of the City-County Building on Division at Lake Streets, and its days of fighting the elements were ended. This cannon — No. 27 — was likely the 27th one made for the first order of 30 cannons that James Ripley, Brigadier General, Chief of Ordinance asked, Nov. 14, 1861, that Revere Copper Company Of Boston, Mass., to manufacture. The tone of the orders show the urgent need for artillery by the North in the first years of the Civil War. From the Revere Company about 343 were ordered within two years, plus orders to other companies. Chief Ripley begged for an output of five cannons per week. The cannon's war history not surfaced, as from which battlefield it spoke out for victory and unity or under which general it served. But as it was shipped from Boston and was of the first order, it likely stayed in the north eastern part of the country. We will comprehend its unutterable history by general written accounts of bravery, courage and endurance in those terrible years left of the Civil War that ended with a united country; a war that veterans speaking of each others as "Comrades" and striving to meet at annual encampments. Pride and certainty of home and country was their reward for the suffering and privation that this cannon has witnessed.